BISMARCK, N.D. – U.S. Senator Heidi Heitkamp today called on U.S. Postmaster General Megan Brennan to take concrete steps to protect quality mail delivery and service in Amidon and Halliday now and in the future following the news of the anticipated post office closure in Amidon and service disruption in Halliday. Heitkamp pressed Brennan to make sure her agency is listening to the needs of the Amidon and Halliday communities, and to communicate a comprehensive plan on how the needs of both communities to access the full array of postal services will be met. Click here to read Heitkamp’s letter to Brennan about the impending post office closure in Amidon, and here to read her letter to Brennan about the post office closure in Halliday. 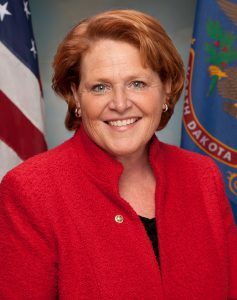 Today’s call builds on months of Heitkamp’s work to improve mail service across North Dakota – particularly in rural areas – through her Fix My Mail initiative and survey, to which hundreds of North Dakotans have responded with stories on the mail challenges they have experienced at their home, business or community. Just two months ago, Heitkamp brought Brennan to North Dakota to visit a mail processing facility, hear firsthand from community and business leaders about how North Dakotans have been impacted by slow service and delivery delays, and to discuss lasting solutions to improve their mail delivery and service. Brennan agreed to Heitkamp’s request to visit North Dakota in April after Heitkamp shared her Fix My Mail surveyresults with the Postmaster General. To date, nearly 600 North Dakotans have filled out the Fix My Mail survey since its February launch. The results revealed major challenges for residents throughout the state – from medications and tax information lost or delayed in the mail, to batches of checks taking 10-20 days to travel 180 miles across the state. North Dakotans in rural communities rely heavily on the Postal Service to support their businesses and to connect them with family, and are disproportionately impacted by poor service and delivery – a point echoed in a Postal Service Inspector General report on mail volume. Over the past few years, rural America has faced increased delivery times, reduced service standards, and a distressed Postal Service workforce. Long an advocate for improved mail delivery in North Dakota, Heitkamp’s efforts began shortly after taking office in 2013 when she heard from constituents about ongoing problems with mail service. Dakotas District could care less, if you receive your mail (or at all). Like one Dakotas District MPOO told me “you need to be looking out for yourself first”. Run the place in the ground, collect a bigger retirement and retire. That is the goal of Dakotas District.